Time to get your fashion hair fix! 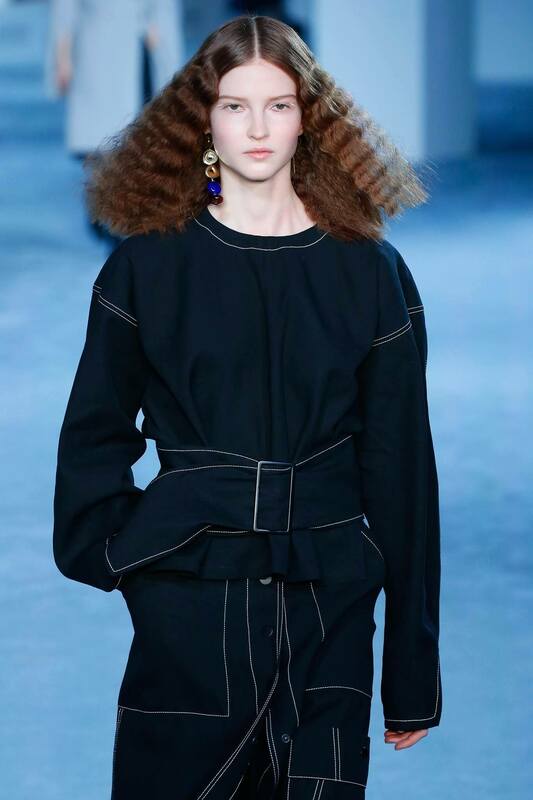 With New York Fashion Week over, we’ve put together a runway report to give you the lowdown on all of the most memorable (and wearable) hairstyles from the runways. Just click through the gallery above for a quick sneak peek at our highlight hairstyles or keep on reading to learn more about the looks we plan on wearing for the season ahead. 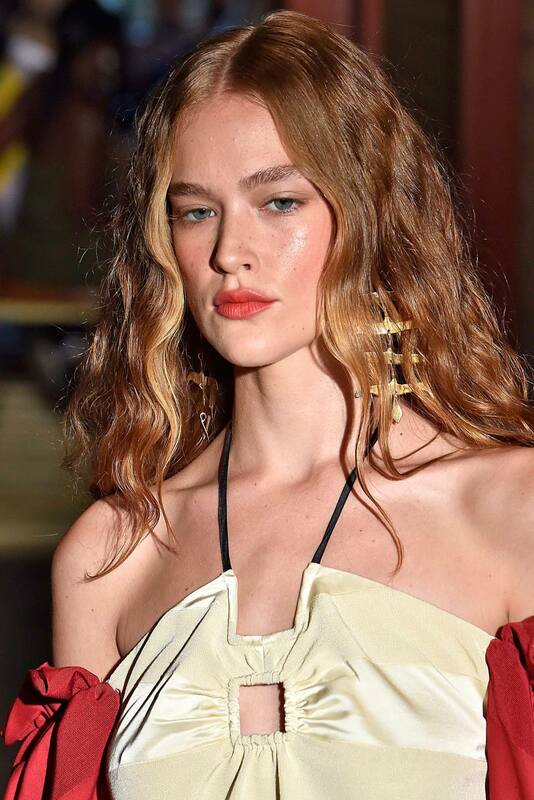 Often remembered as a hair faux pas, the ’80s loved crimped hair trend is back and today’s version is thankfully a lot more wearable. Wear your crimped hair with a centre parting and start your crimped waves a few inches away from the roots. Editor’s tip: Whether you’re using a crimping tool or pressing the straightener over braids, we suggest using a heat protect spray beforehand. We love the TONI&GUY Prep Heat Protection Mist for protecting hair against heat styling up to 230°C and for achieving a soft and smooth finish. 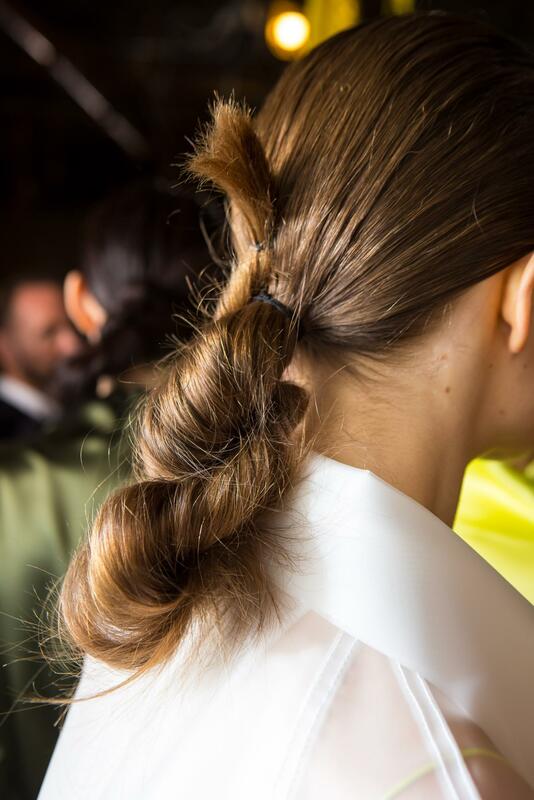 When we spotted the much-loved and easy braided hairstyle on the Tory Burch runway we couldn’t have been happier, it’s our go-to (read lazy) look everywhere from the office to the gym, and with its runway nod, we’ll be wearing ours with pride from now on. 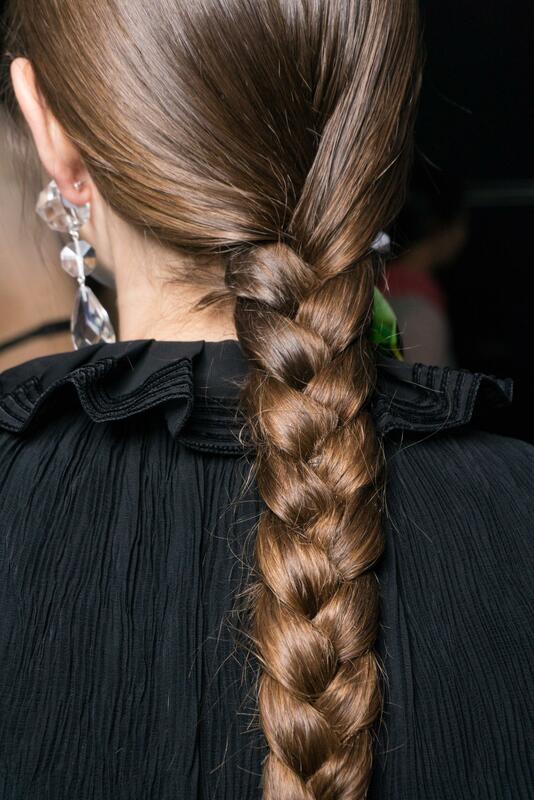 Style tip: We know much you love a messy braid, but this time it’s all about a smooth and sleek finish. So tame those flyaways and smooth those short strands for a flawless finish. 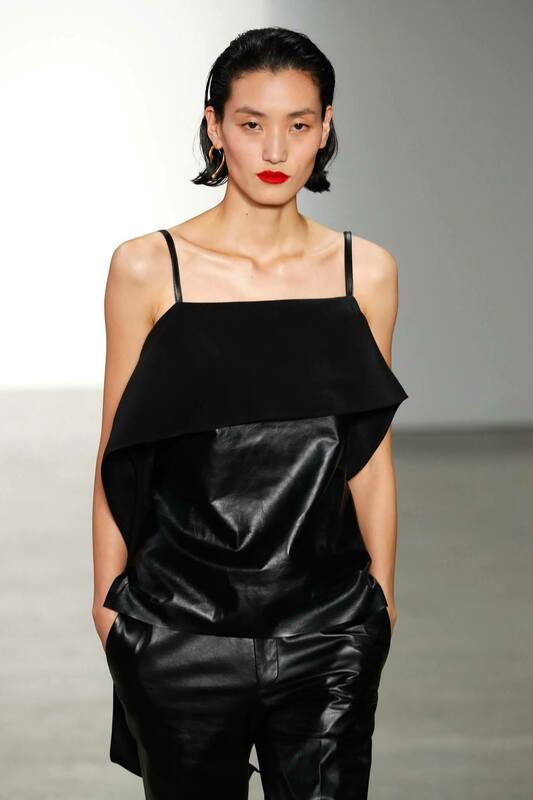 From Boss, Bibhu Mohapatra and Helmut Lang, swept back styles have been sweeping (sorry we had to) the runway this season. Get in on this look whether you have short strands or lengthy locks, we promise, you won’t regret it. Editor’s tip: Keep your hair in check with a firm hold hairspray. 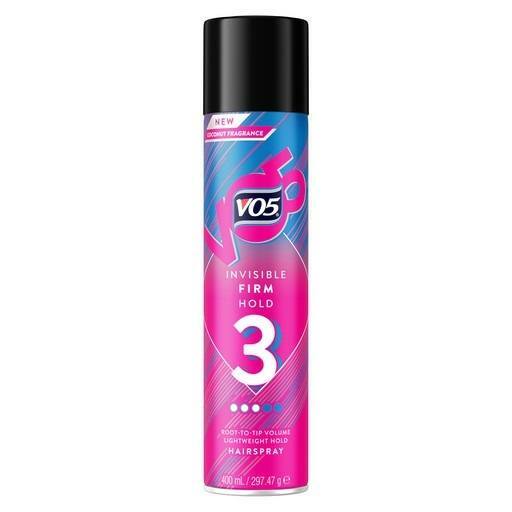 With 24-hour humidity protection and UV filter, the VO5 Firm Hold Hairspray is perfect for swept back styles and emergency touch-ups. It was all about unravelled buns at Dion Lee for their FW19 show. Hair was placed into a low ponytail and the lengths twisted and secured with a bobby pin. Looking for work hairstyles that can take you from the boardroom to the bar? Then this low ponytail hairstyle is the look for you. Models wore their hair in side-parted immaculate low ponytails with hair wrapped around the elastic for a polished and professional finish. Editor’s tip: This hairstyle calls for an anti-frizz serum that offers a high shine finish, and lucky for you, the TONI&GUY High Shine Serum Drops is perfect. Work 2-3 pumps between fingers and smooth through lengths of dry, styled hair avoiding the roots. Models showcased simple everyday hairstyles as they literally danced their way down the Staud runway. Long, short, straight and curly, the only hair rule was to keep hair away from the face whether pinned or gelled at the roots. 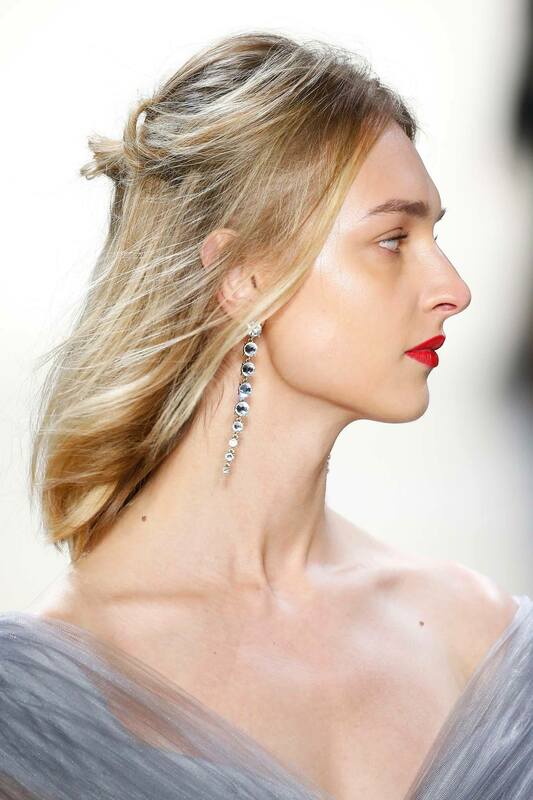 The hun (AKA half-up, half-down bun) is the quick and easy style to be spotted with in 2019. From lounging on the sofa to brunch with friends, this is the hairstyle we’ll be wearing all weekend long. Style tip: For the runway look, remember to keep the style messy and undone. You don’t have to wait until summer to start wearing these chic, upgraded beachy waves. In fact, if you follow our easy heatless curls tutorial tonight, you’ll wake up with effortless off-duty waves in the morning. Don’t fret if you’ve woken up with bedhead hair — embrace your carefree, boho texture and adorn your strands with daises. 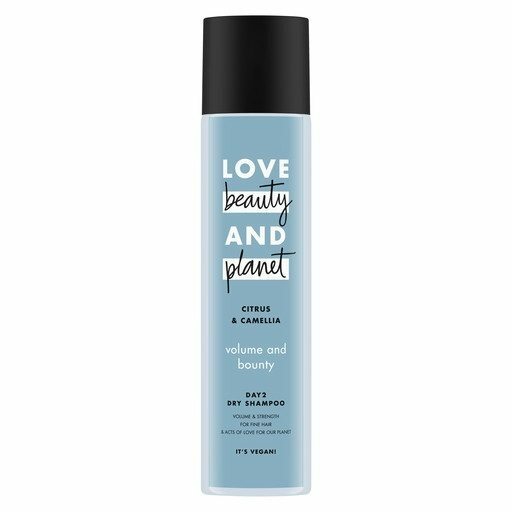 Editor’s tip: To give your second-day hair a quick makeover, just spritz the Love Beauty And Planet Volume & Bounty Dry Shampoo on your roots. It’ll help give your mane an extra texture boost and leave it feeling fresher. This fluffed-out natural hairstyle from Mara Hoffman, is the summer vibe you’re going to want channel on your next holiday (or now, if you’re eager). Next read: Cute flower hairstyles for natural hair. 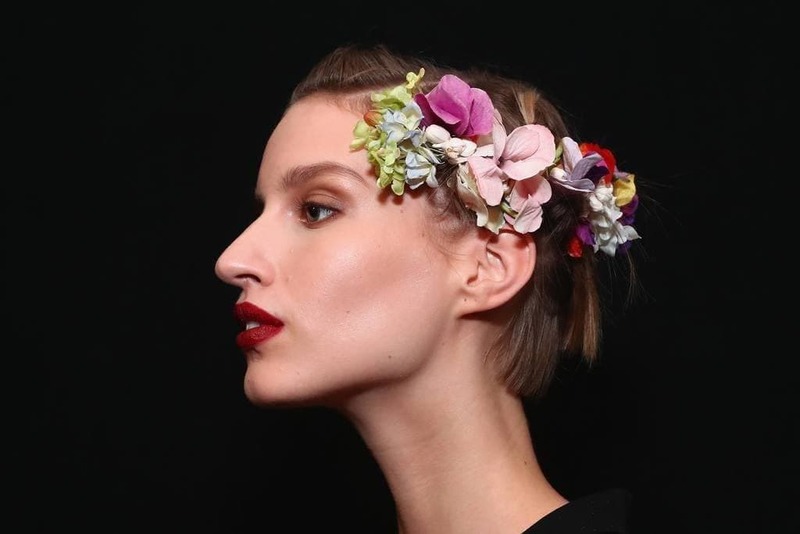 As if we needed another reason to make our hair look like a flower garden! If you’re looking for a whimsical look or want to look stylish rather than scary for Halloween, in our opinion, Rodarte’s runway hairstyle is all you need. This knotted, high-fashion spin on a sleek low ponytail is not only suitable for everyday wear, but the perfect day-to-night style, too. Just don’t forget the fashionable hair accessories, will you? 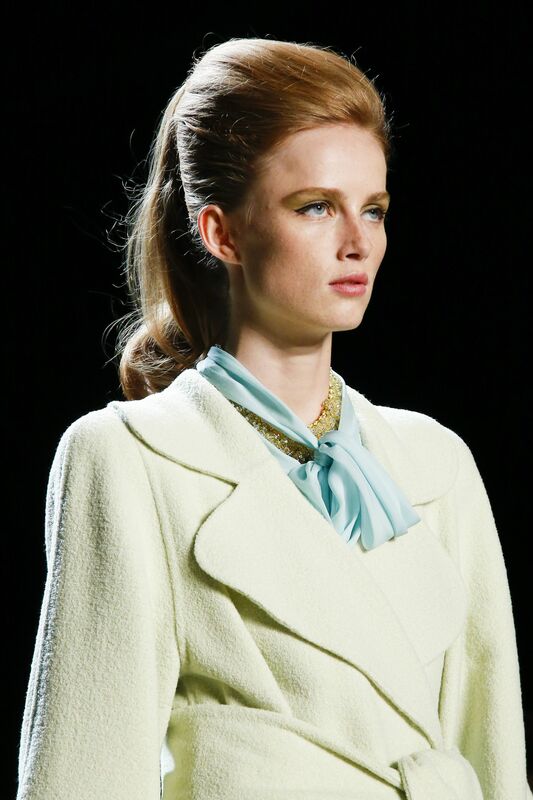 Can’t decide between an elegant bouffant or a wavy ponytail? Easy. Just wear both like the models on the Marc Jacobs runway. Ready to give your hair a quick vintage revamp? 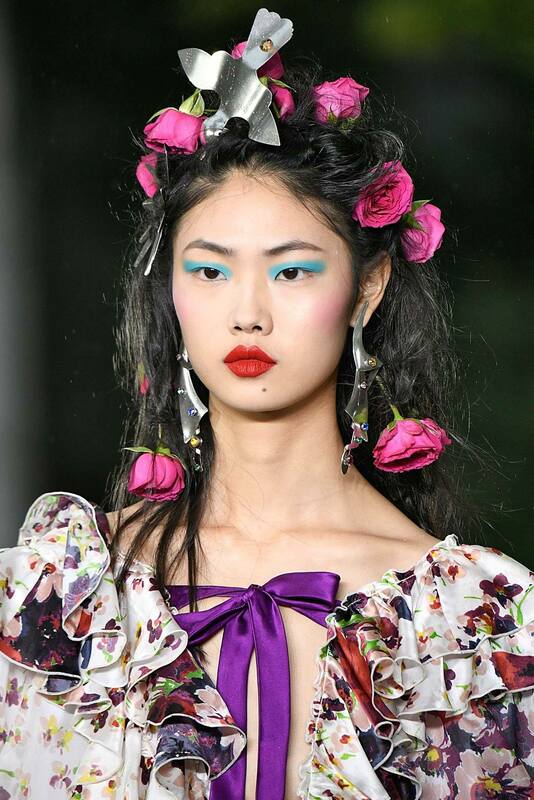 Try recreating this rockabilly bun updo we spotted at Anna Sui — it’s an easy way for you to dip a toe into retro hairstyles. Sometimes poker straight hair is just the way to go, especially if it means you get to try the glass hair trend (AKA super shiny hair). The key to nailing this look? To slick back your strands with a shine spray, after running your strands through straighteners. 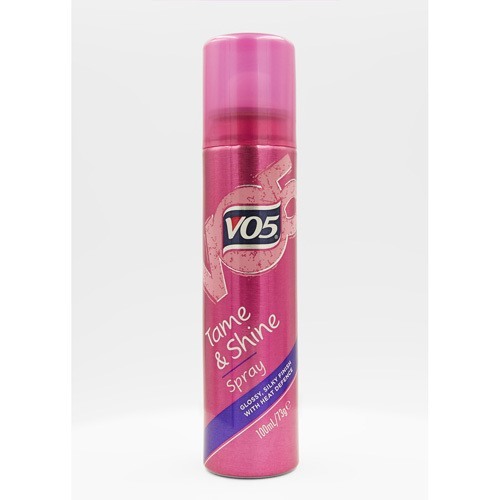 Editor’s tip: Spritz your mane with the VO5 Tame & Shine Spray before and after styling to give your hair a glossy finish and keep any annoying flyaways at bay. Nothing is worse than trying to manage post-beach locks, right? 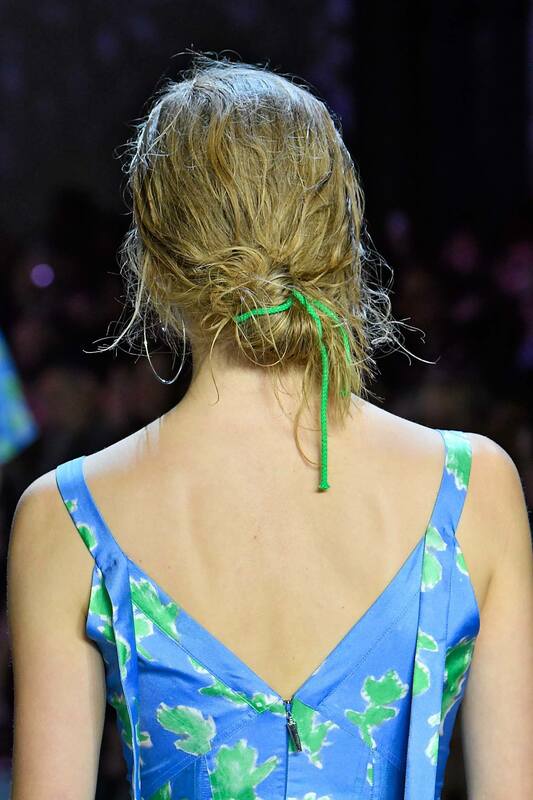 Solve this problem by styling your strands into a low bun with a hair accessory of your choice, à la Prabal Gurung. Sleek and chic is the name of the game. Taking things back to basics (yet no less chic) were the girls of the Carolina Herrera SS18 show. Simply parting the hair down the centre and tucking it behind the ears, the lengthy tresses of each model were kept sleek and shiny, proving that you don’t need to have a complicated ‘do to win at the fashion game! There’s no power like flower power. 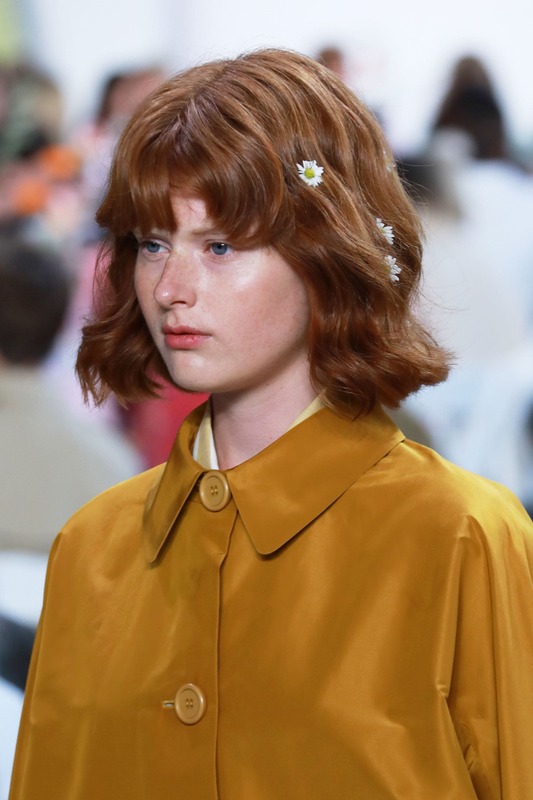 We’ve already seen flower crowns and anti-flower crowns this festival season, but now it seems the fashion crew have picked up on it and given the trend their own twist on all things floral. 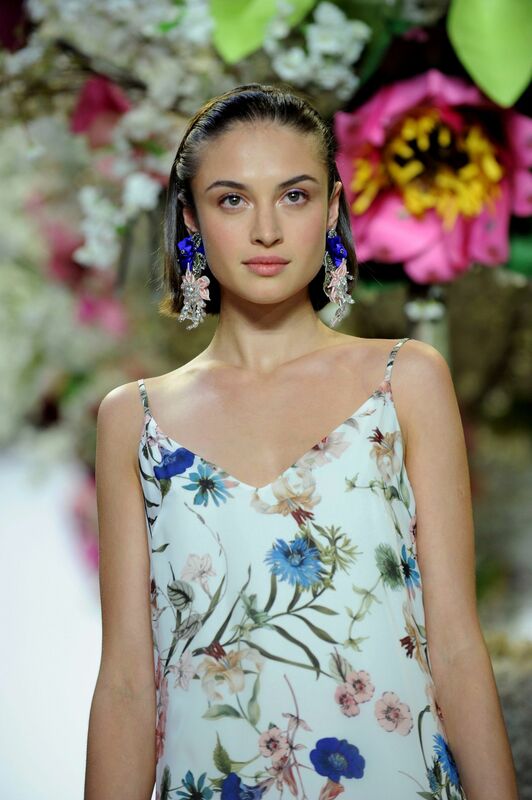 Over at the Naeem Khan runway show, the trend was stripped back and given a more delicate touch, adding soft-hued flowers into the sides of the models’ hair. 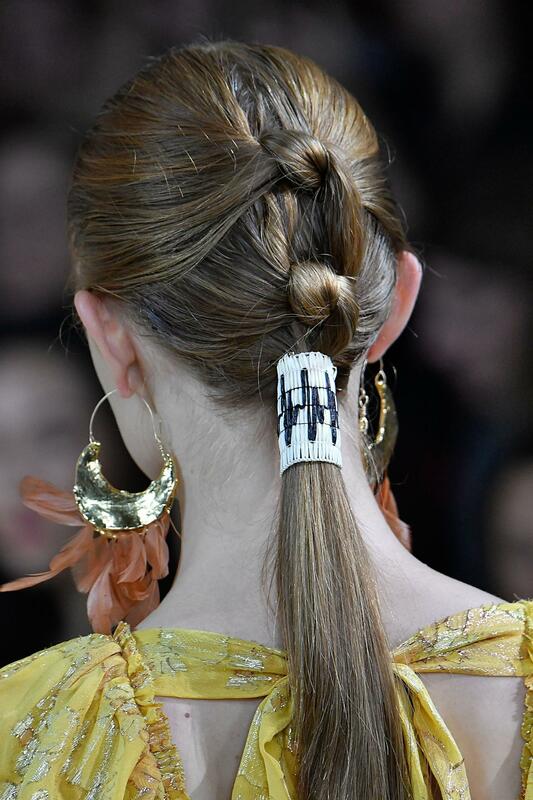 Interwoven into loose braids, models of all hair types and lengths worked the look, showing that it’s a trend for all! Simplicity really is the key to great style. We all know that hair accessories are an easy way to style our manes without even trying, which is why we’re always on the hunt for new ones. But this season you don’t even need to shop around for new accessories, as you already have the only ones you’ll need: bobby pins. 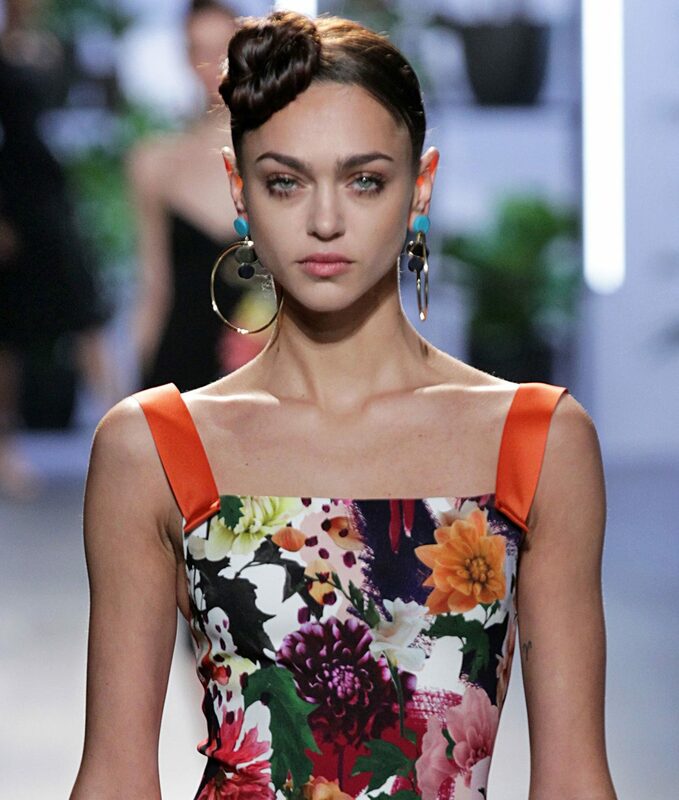 Take your next style cue from the Sally La Pointe runway and use your bobby pins to create a uniform pattern in your hair. 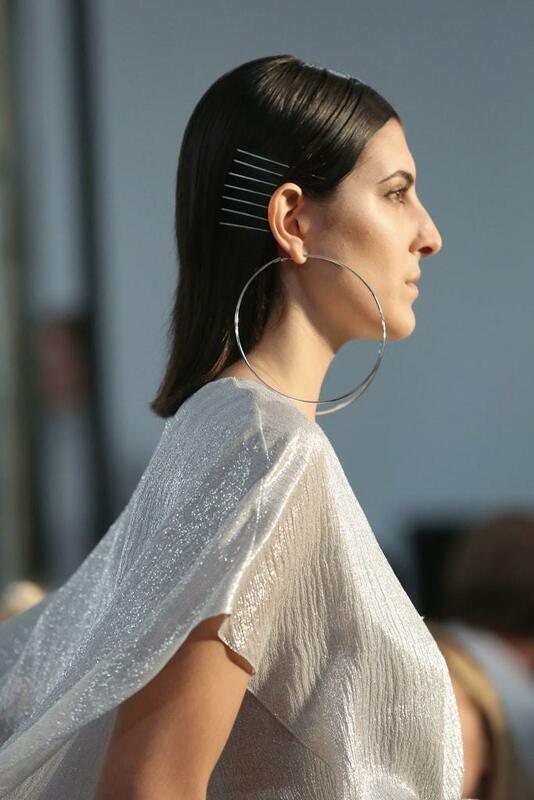 Opt for silver pins with matching oversized hoop earrings and you’ll be miles ahead of the crowd with a futuristic style! Tom Ford’s spring/summer collection centred around sharp, angled tailoring and power-suit shoulders — and the hair was styled to reflect this. Models (including our faves, Kendall Jenner and Gigi Hadid) donned wigs cut into piecey, pixie cut styles, which emulated their own natural hair textures for a more believable effect. Editor’s tip: Have Tom Ford’s pixies inspired you to go for the chop for real? 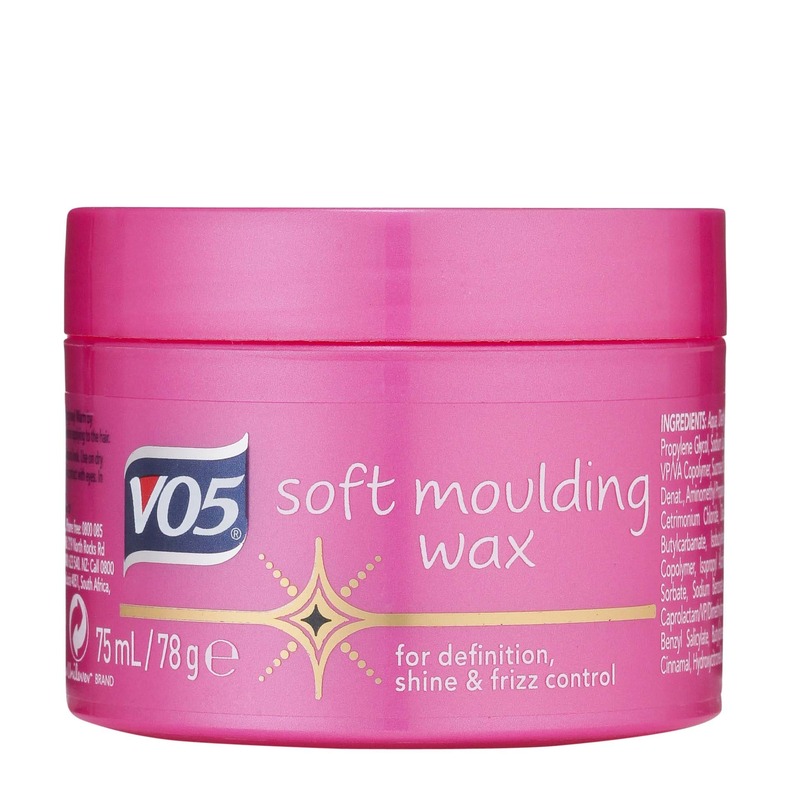 You can recreate Gigi’s piecey pixie by using a workable wax (like the VO5 Classic Styling Soft Moulding Wax) to define and style your layers for a choppier, retro finish. We’ve seen the trend for ultra-long, waist-length hair blowing up in recent months thanks to stars like Kim K-W and Nicki Minaj, and it seems this inconvenient but oh-so-Instagrammable craze is set to continue into next year. 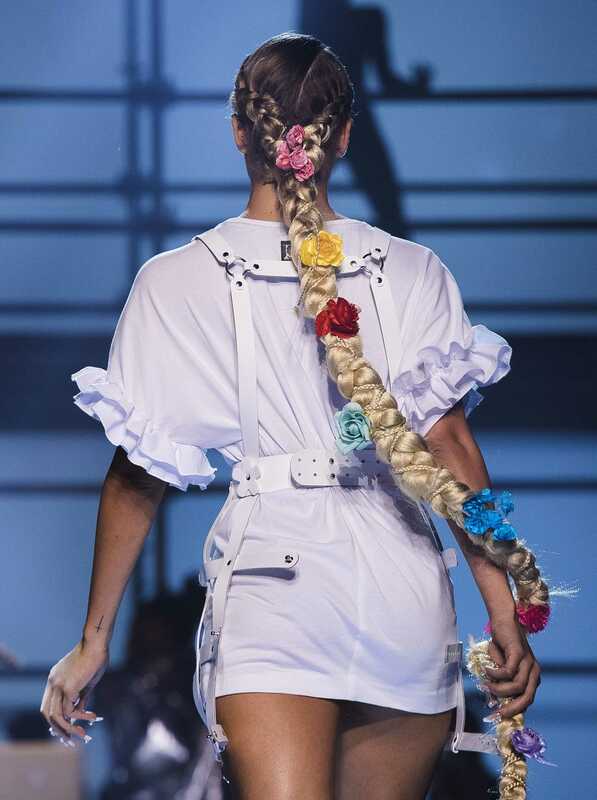 Philipp Plein sent models out with large, never-ending Rapunzel braids, featuring teeny tiny wrapped braids for detail, and adorned with beautiful pastel flowers. It might not be the most practical style we’ve ever come across, but if ever there was a time for the “heart eyes” emoji, this would be it! Girls wore their locks in a refreshingly spring-like texture with intentionally unkempt curls. And while the look appears to be totally effortless, the finish was actually created by curling tiny pieces of hair before being styled into a half-up, half-down hairstyle. 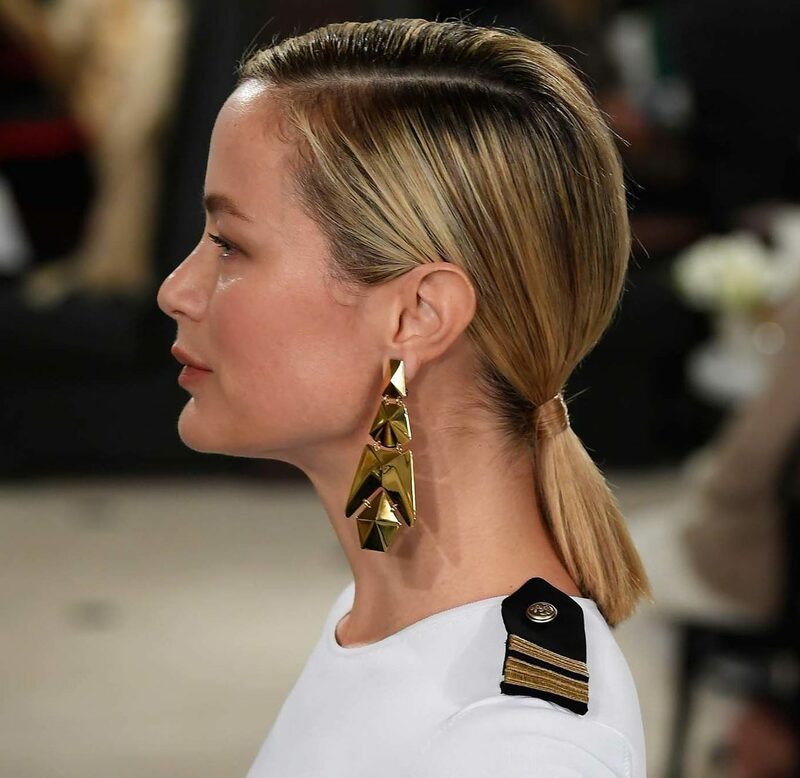 In total contrast to Jonathan Simkhai’s messy manes, Cushnie Et Ochs went for a perfectly-polished chignon bun positioned on the side of the girls’ foreheads. The ultimate girl-boss style, it makes a cute and quirky change to a regular ballerina bun and we can totally see ourselves walking into our next meeting with this fancy ‘do! Want to give your pony a fashion-forward edge? With a slick centre parting and white leather wrap detail covering the majority of the pony, Ulla Johnson’s structured ponytails were the perfect style to contrast with the ethereal, vintage vibes of the collection. Ashley Benson just dyed her hair platinum blonde – have you seen?